A 17-year-old boy has been arrested after a 33-year-old man was stabbed in Cardiff in the early hours. 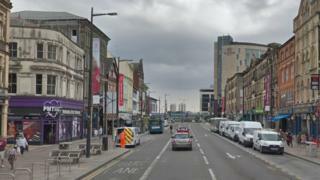 The man from Birmingham needed hospital treatment for a minor stab wound sustained in an assault, South Wales Police said. The boy was arrested on suspicion of wounding with intent. Roads have since re-opened following an initial investigation into the incident between Wood Street and St Mary Street at 02:00 GMT, the force said.